Added on October 23, 2014 by Alexander Osterwalder. At the beginning of October I was invited to Washington DC by the US National Institute of Health (NIH) and the US National Science Foundation (NSF) to introduce Value Proposition Design to 20 life science startups. It was amazing to see how quickly they adopted it. This new program I was invited to is called the NIH Innovation Corps (I-Corps™) and illustrates how far the Business Model Canvas, Value Proposition Canvas, and Lean Startup process reach beyond web and mobile startups. In fact, in the Life Sciences their application ranges all the way from startups launched by scientists, over NGOs and Venture Capitalists, to the largest pharmaceutical companies of the world. Watch Steve Blank talk about the impact of our methods in the Life Sciences. He initiated this new program with an outstanding panel of VCs and life science entrepreneurs. I had a lot of fun teaching these life science entrepreneurs to use the Value Proposition Canvas and watching them adopt it immediately. Most of the entrepreneurs focused on explaining their research, technologies and products rather than making explicit how they (intend to) create value for potential customers. 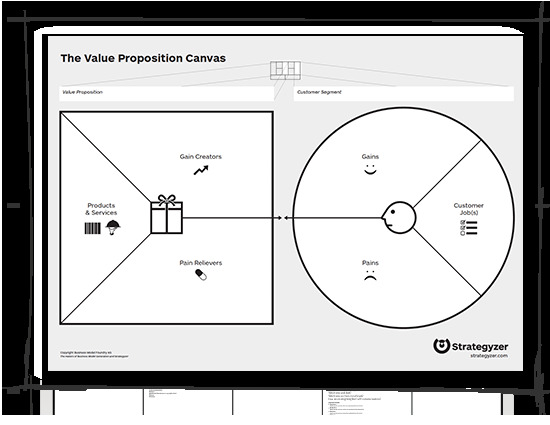 -> The Value Proposition Canvas forces them to show the fit between their research, products and services and what really matters to their potential customers. When they presented their value propositions they were not very precise about how they create value. They said "better", "faster", "more effective" rather than "20% faster", "5% more effective", etc. This was very surprising for scientists who are very precise when it comes to their research, but much less so when it comes to business. -> I showed them how to be extremely precise regarding their customers' pains and gains, because it allows them to evaluate if their value propositions address real customer concerns. It was humbling to see how these life science entrepreneurs are helping change the world and save lives. I was deeply honored to contribute in a small way and help them develop relevant value propositions for patients, doctors, hospitals, or reimbursement bodies. In what other areas can you see relevant applications for value proposition design?